Urgency of treatment of hand infections Hand infections can cause severe problems that persist even after the infection has resolved, such as stiffness, loss of strength, and even loss of tissues such as skin, nerve and even bone. Thus early and aggressive treatment of hand infections is essential. When seen early, some types of infection can be treated with antibiotics and local rest and soaking. However many infections begin to cause severe problems, even after a day or two, if not treated with antibiotics, surgical drainage, and removal of infected tissues. Any drainage or pus should be sent for laboratory testing to determine the type of bacteria causing the infection and the appropriate antibiotic for treatment. 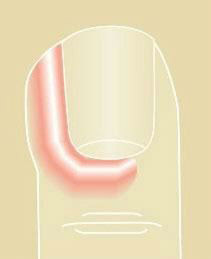 Paronychia A paronychia is an infection of the cuticle area around the fingernail (see Figure 1). Acute paronychia is caused by bacteria, and presents with redness, swelling, pain, and later with pus. Early cases may be treated with soaks and antibiotics, but if pus is seen or suspected, drainage by lifting the cuticle and/or nail, or lancing the area, is required also. Chronic paronychia is caused by fungus, and the cuticle area becomes just mildly red and swollen, with scant or no drainage and mild tenderness. It occurs in people whose hands are frequently wet, such as bartenders. It may be treated with special medication and reduction or elimination of the constant exposure to moisture, which promotes this fungal infection. On occasion, surgery is needed to remove infected tissue. It is commonly mistaken for a bacterial infection. Prolonged treatment is common with chronic paronychia. Felon A more serious and usually more painful, throbbing infection, called “felon”, occurs in the closed space of the fatty tissues of the finger tip and pulp (see Figure 2).This usually requires surgical drainage and antibiotics. If not treated early, destruction of the soft tissues and even bone can occur. Herpetic Whitlow Herpetic whitlow is a viral infection of the hand, usually on the fingers, caused by a herpes virus. This is more commonly seen in healthcare workers whose hands are exposed to the saliva of patients carrying herpes. The condition, characterized by small, swollen, painful blood tinged blisters, and sometimes numbness, is typically treated conservatively and typically resolves in several weeks without many after-effects. Septic arthritis/osteomyelitis A wound in or near a joint, or a draining cyst from an arthritic joint can cause a severe infection of the joint, septic arthritis. In just a couple of days, the joint can be destroyed by the bacteria eroding the cartilage surface of the joint. Surgical drainage is required, in addition to antibiotics. If this treatment is delayed, infection of the bone can occur, a complication that is called osteomyelitis. It typically requires one or more operations to remove infected tissue and many patients require weeks of intravenous antibiotics. Deep space infections There are spaces in between the different layers of structures in the hand which can become infected, even from a small puncture wound. These may affect the thumb area (thenar space), the palm (deep palmar space) or even the web area between the bases of fingers (collarbutton or web space abscess). These require surgical drainage, and they have potential to spread to other areas, even to the wrist and forearm. Tendon sheath infection If a small laceration or puncture wound occurs over the middle of a finger, especially near a joint on the palm side, an infection of the flexor tendon can occur. These can often cause severe stiffness, even destruction and rupture of the tendon. These present acutely with stiffness of the finger in a slightly bent posture, diffuse swelling and redness of the finger, tenderness on the palm side of the finger, and severe aggravation of pain with attempts to straighten the finger (see Figure 3). This infection requires immediate surgical drainage of the tendon sheath and antibiotics. Atypical mycobacterial infections In rare instances, a tendon sheath infection can be caused by an “atypical mycobacterium.” These develop gradually and may be associated with swelling and stiffness without much pain or redness. This type of infection is treated with special antibiotics for several months. Surgical removal of the infected lining of the tendons may also be necessary. Residual stiffness is common, despite treatment. Such infections may involve other soft tissues as well. Mycobacterium marinum is a common form and typically develops after puncture wounds from fish spines, or contamination of a simple wound or abrasion from stagnant water (in nature or from aquariums). Identification of the organism can be difficult. Patients with impaired immune systems(AIDS patients, cancer patients) are more susceptible to atypical mycobacterial infections. Infections from bite wounds Infections from bites, from humans or animals, are typically associated with several bacteria. Although Streptococcus and Staphylococcus can be involved (driven in from the skin by a tooth), other organisms common to the mouth may be seen and typically require other or additional antibiotics. Eikenella corrodens is often seen with human bite injuries and Pasteurella multocida is seen with dog and especially cat bite wounds. Wounds frequently are not closed after treatment so that any infection can drain out, and deep structures such as joints may be involved. Surgical trimming of infected/crushed tissue is often required. Rabies infection from an infected animal may be serious, even fatal. Treatment is associated with risk. Fortunately, the reported cases of rabies in humans are rare, and the incidence of rabies is small in domestic animals, most cases coming from bites from wild animals.